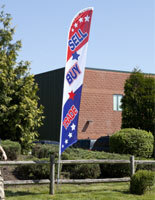 Grabbing the attention of passersby is an important marketing strategy for any business. 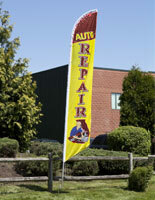 What better way is there than to display a fluttering automotive feather flag out in front of your establishment? 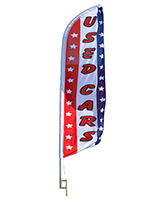 Whether you run an auto repair shop or used car lot, take advantage of what these outdoor advertisements can do for your bottom line. 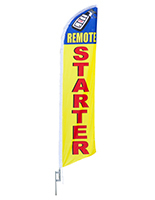 Featuring a quick and easy one-person assembly, each flag comes in at a towering 14 feet in height and slides onto the aluminum support spine. 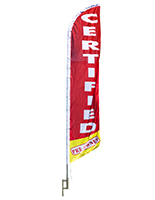 Insert the stake into the ground to allow the flag to turn and flutter in the wind. The dyed fabric displays the graphic on one side only, with the reverse print showing on the back side. 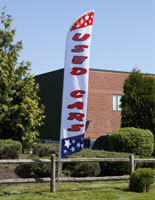 We sell a number of universally recognized stock messages designed for the automotive industry at a low, low price. These outdoor advertisers are impossible not to notice, and they can provide an even bigger marketing impact when multiple flags are staked in rows.